Gov. 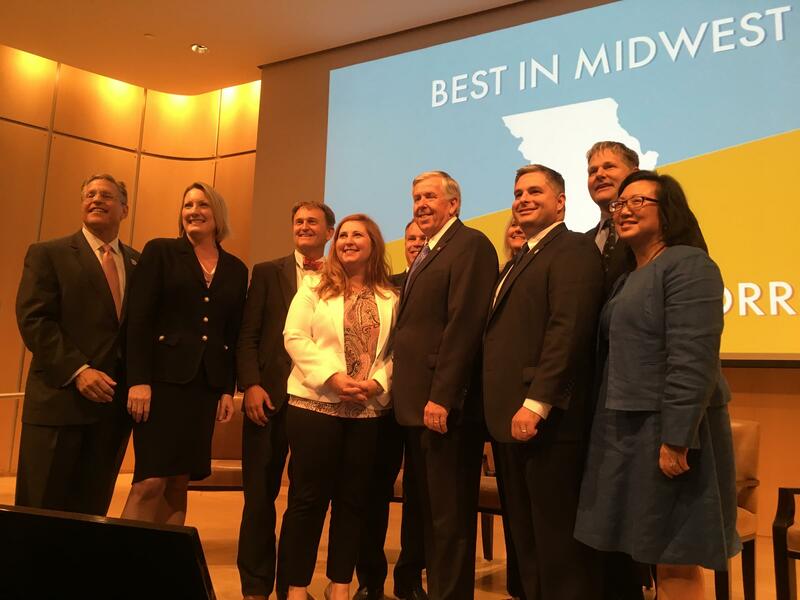 Mike Parson poses with organizers of the Best in Midwest and Talent for Tomorrow Summit, where infrastructure and workforce development were top of the agenda. Parson was referencing the “Missouri Gas Tax Increase, Olympic Prize Tax Exemption, and Traffic Reduction Fund Measure” that will appear on the November ballot statewide. If the proposal is approved, it will increase the motor-fuel tax by 10 cents over four years. It is the first attempt to impose a gas-tax increase since 1992. The governor did not outline any specific policies or programs to improve workforce development or infrastructure during his brief remarks. But he said that the two issues have emerged as the biggest concerns he’s heard from Missourians as he’s toured the state since becoming governor June 1. The governor said while change is difficult, it is necessary “to do something different” to transform Missouri into an economic powerhouse and leader in the region. The Department of Economic Development convened Wednesday’s Best in Midwest and Talent for Tomorrow Summit that will send recommendations to the governor on new strategies for workforce development. The Department of Higher Education and the Hawthorn Foundation partnered with the DED on the initiative. This article first appeared in the St. Louis Beacon, Oct. 12, 2011 - Next week could be the last chance for Missouri lawmakers to pass an economic development bill in the special session of the Missouri General Assembly. This article first appeared in the St. Louis Beacon, Nov. 16, 2011 - Gov. Jay Nixon says he plans to move swiftly to find a replacement for Missouri Economic Development Director David Kerr, who will be leaving his post as of Dec. 31. Kerr has headed the department since November 2009. According to Kerr's statement, he wants to spend more time with his family "after well over 35 years in the public and private sectors."